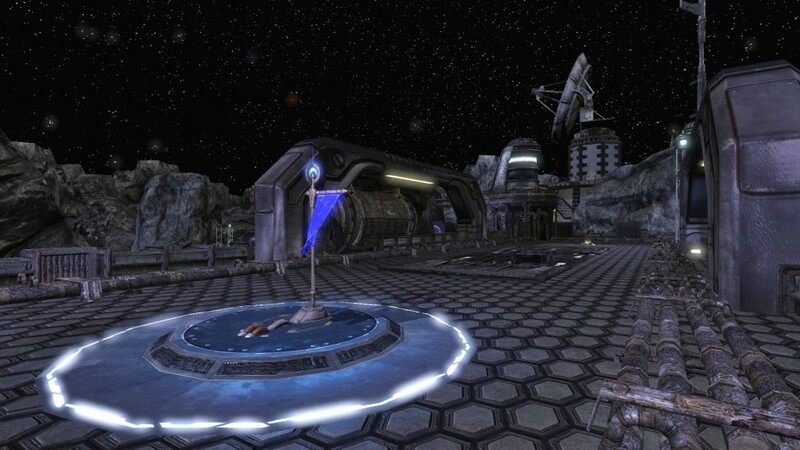 Steal the flag of the enemy team and return it to your base while navigating a space mining operation. 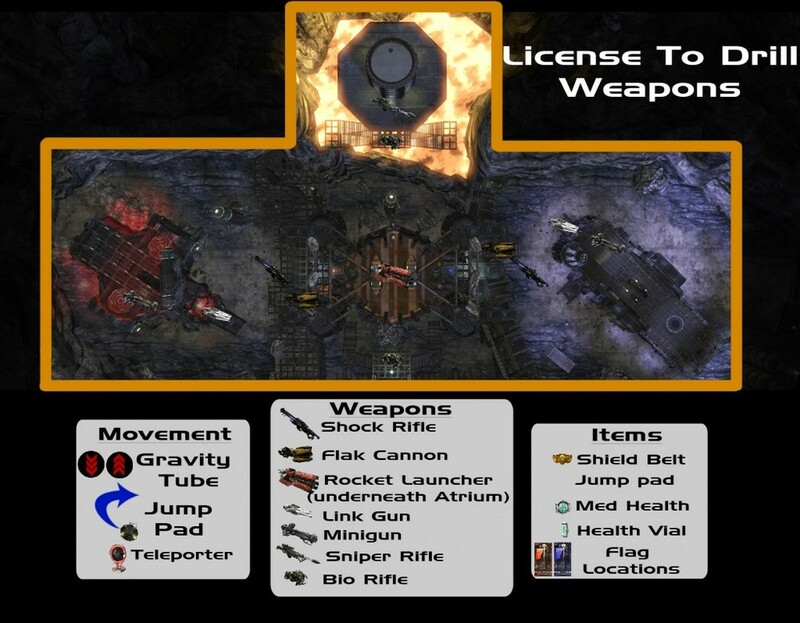 "License to Drill" is a multiplayer Capture the Flag map for Unreal Tournament 3 where players navigate an industrial drilling site to get to the other team's flag. I really enjoy level hazards. 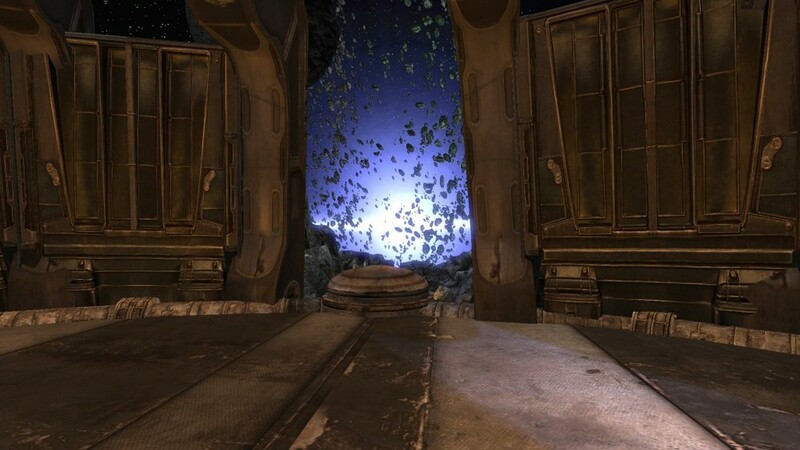 They add an x factor to any game that can make a map truly memorable. I found it fitting that the level hazard for this map was the drill bit. If a player happens to wander too close to the bit, they'll get chewed up and killed instantly, spreading gibs all around. I knew I had something when I noticed that every playtester immediately asked, "Will that kill me?" followed by laughter as their character is converted into red mist. I modeled and textured the drill bit and created the particle from scratch. I wanted the players to be feel like they were on a planetoid in a mining facility, and I also needed a light source for my dominant directional light. Making a 3 sided crater with a canyon on the fourth side fulfilled both of those desires. I also made it visible from almost every spot in the atrium to help players orient themselves. If the vista of the blue supergiant was on the left, you're headed towards the red base; otherwise, you're headed towards the blue base. "License to Drill" is the third Capture the Flag (CTF) map I've made in Unreal. This time around, I had a much better understanding of the editor and its capabilities. This map features three distinct avenues for players to take across the atrium. The first is the pit, which allows players to move about and dodge in a medium to close range environment. 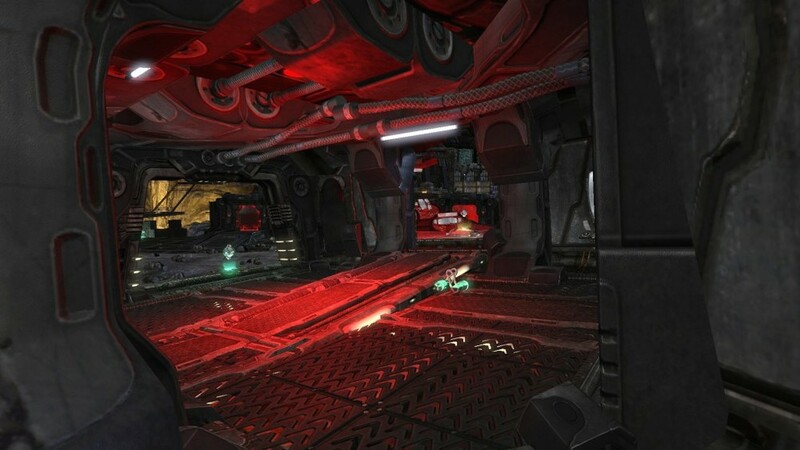 Gravity tubes with entrances and exits in the pit allow players to traverse the map to the required elevation to get to or away from the enemy base. 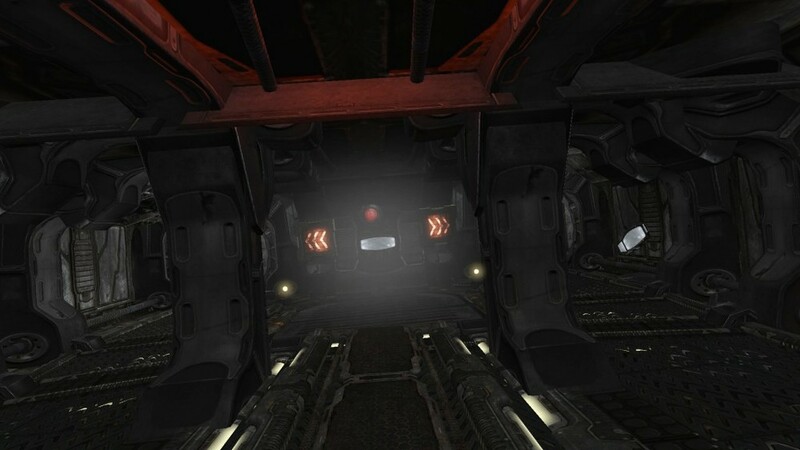 The underside of the drilling rig, which offers little area to maneuver about, but rewards the players with the most direct path and an opportunity to snag the rocket launcher. This avenue is taken often when players are rushing to defense of a flag carrier, or when a rocket launcher is desired. The top of the rig is a mini atrium, with a shield belt, two health spawns, and both flak cannon spawns. 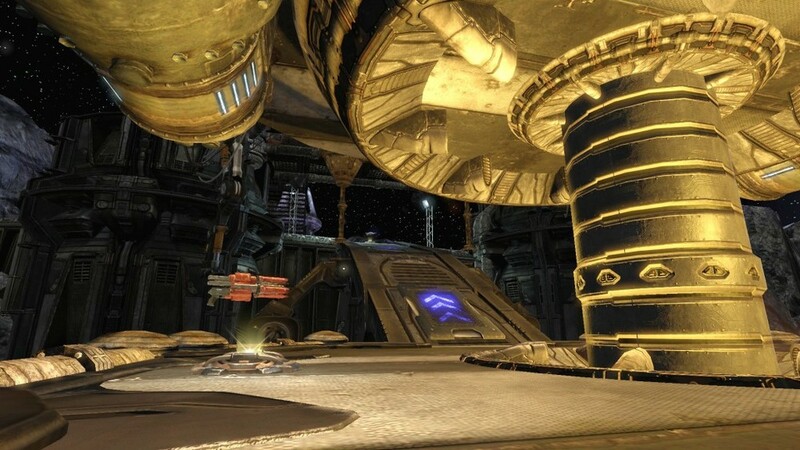 The middle of this mini atrium features armored walls to protect any combatants inside from most of the shots taken by anyone at the sniper tower located across the map. I intended this to be reminiscent of a coliseum or cage fight, and was pleased to find players using it for the high value items located inside. Each base is identical in its design, but with radically different design motifs. The red team is represented with a crashed shuttle, and is noted by its fires and red alert lights which fade in and out. Getting the materials to match the lights was a hard earned win. It took a few hours of goofy matinees to not work correctly to get me to look for a new method, which I found in light functions. The blue base’s design was more of an industrial complex intended to give the drilling rig context. Giving it identical cover while making each base visually distinct was a challenge, but I feel it came together in the end. The drill was a fun project as well. I wanted to make a drilling rig, but what drilling rig is complete without a drill bit? The bit was fun to model and texture, but the most fun was making particles to make it actually look like it was drilling through rock. I learned the cascade system much better than I did before this map, and my capabilities with it have soared. Whenever players first see the drill they all ask aloud, “Oh man, does that thing kill you?” and proceed to jump into it. Seeing their reactions as they jump into the drill and explode into gibs makes me love what I do. Playtest as often as you can, as early as you can. If you feature something in the centerpiece of your level, you’d better make it interactive in some fashion. Don’t forget a particular playstyle, there are many types of players to make room for in each map. Don’t scrap the whole car if fresh tires are all that’s needed. If a map has good elements or a good design, don’t trash the whole thing if a new environment is required. That’s many hours of work down the drain otherwise!